Ask Ron Koertge what he brings to the realm of young adult fiction, and the seasoned author responds matter-of-factly. "I write dialogue well, and I'm funny," he says--an assessment few would argue with. "I like iconoclasm and practice it in my fiction. I don't like pretense or hypocrisy. I'm almost always irreverent." A faculty member for more than 35 years at Pasadena City College, where he has taught everything from Shakespeare to remedial writing, Ron Koertge is the author of several acclaimed novels, most of them for young adults. That Ron Koertge is a master at capturing teenagers' voices--often in witty repartee--is fully evident in MARGAUX WITH AN X, the story of a sharp-tongued beauty and a quirky, quick-witted loner. "MARGAUX WITH AN X started as a short story, but the heroine wouldn't let me alone," the author says. "She had a story to tell, and she wanted a whole novel to tell it in." Another unlikely pairing is found in STONER & SPAZ, Ron Koertge's funny, in-your-face tale of a young cinephile with cerebral palsy and the stoner who steals his heart. "My wife works with the disabled," the writer says of his inspiration for the novel, which quickly garnered critical acclaim. "One night she came home and told me about a young man she'd been working with. He had C.P. and a terrific sense of humor. Coincidentally, that day I had talked to a former student of mine who'd recently been in rehab for substance abuse. What would happen, I wondered, if those two knew each other?" In addition to his young adult novels, Ron Koertge writes poetry, and has been dubbed "the wisest, most entertaining wiseguy in American poetry" by poet-laureate Billy Collins. 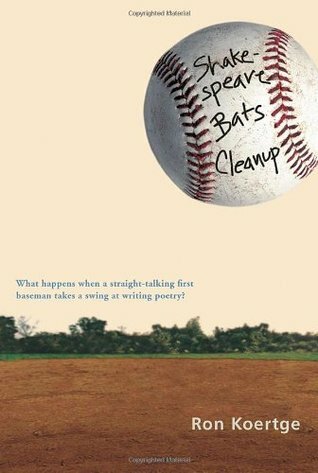 SHAKESPEARE BATS CLEANUP is narrated by a straight-talking, fourteen-year-old first baseman who has been benched by mono and decides to take a swing at writing poetry. Written entirely in free verse, with examples of several poetic forms slipped into the mix--including a sonnet, haiku, pastoral, and even a pantoum--SHAKESPEARE BATS CLEANUP is a veritable English teacher's dream. "The interest in SHAKESPEARE BATS CLEANUP is less with the arc of the plot than with the individual poems, some of which demonstrate poetic form, some of which tell the story," the author says. "One of my biggest challenges was to write like a fourteen-year-old who has a knack for writing poetry, and not just sound like a sixty-one-year-old pretending to be one!" The author's first book with Candlewick, THE BRIMSTONE JOURNALS, is also a novel written in free verse, with 15 different teenage characters narrating four or five poems each. "The book started to nag me a few months before the shooting at Columbine High School in Colorado, and I started to make notes in the form of poems," he says of the hauntingly prescient work. "BRIMSTONE needed to move at high velocity, and this form is perfect for that: no tail fins, no leather seats, no moon roof. Just get in and go." Ron Koertge grew up in an agricultural area in an old mining town in Illinois, just across the Mississippi from St. Louis, Missouri. There he learned to "drive a tractor and buck hay bales, which are clearly useful skills in Los Angeles," he quips. He and his wife live in South Pasadena, California.